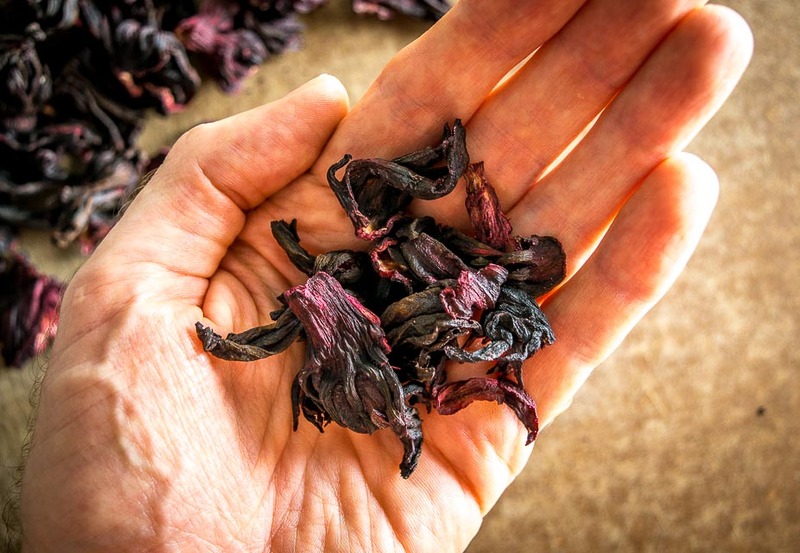 Next time you come across one of these bags of Hibiscus flowers, consider buying it — you can use them to make a delicious batch of Agua de Jamaica, one of Mexico’s most common agua frescas. You’ll definitely find these Hibiscus flowers in Hispanic markets, but even some general grocers are starting to carry them. Sometimes you’ll see them labeled as Flor de Jamaica. Give ’em a squeeze and buy the ones that are still soft, if they are hard and brittle they are probably a bit past their prime. Then it’s just a matter of steeping the flowers and you’ve got an authentic batch of Agua de Jamaica on your hands. Most restaurants in Mexico that offer Comida Corrida will serve up an agua fresca alongside the day’s special. 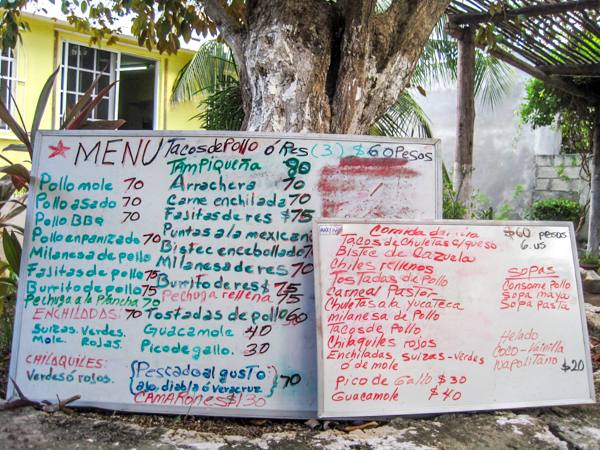 Here’s a menu from a Comida Corrida spot in Cozumel. Don’t let the chaos of that awesome menu board fool you — it was real deal Mexican food. You can see the Comida Corrida options on the board to the right — all for 60 pesos! And served up with a daily agua fresca that could include Tamarind water, Horchata, Watermelon water, or of course…Agua de Jamaica. 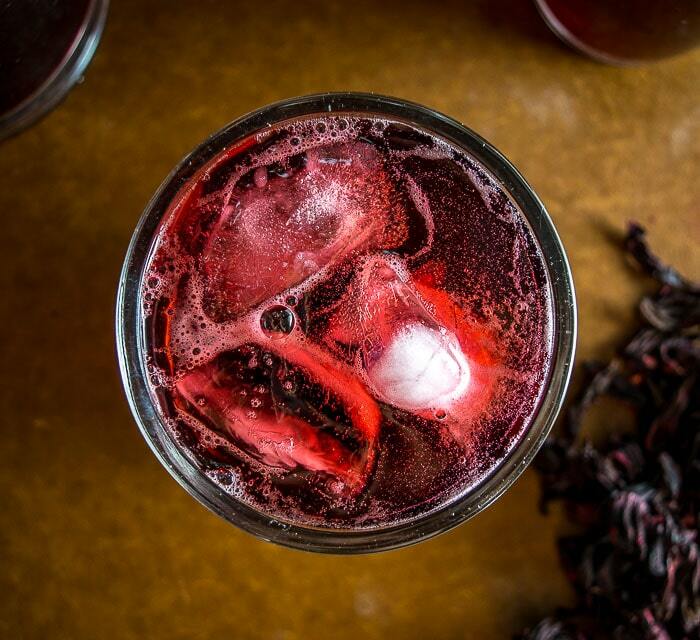 Agua de Jamaica is as close to the source as you can get, and it might make you view the tea aisle in the supermarket from a newfound perspective. The process is simple. And ancient. Add 1.5 cups of Hibiscus flowers to a pot along with 4 cups of cold water. Bring to a boil and then remove the pot from the heat. Set aside, cover, and let this steep until it cools, 30 minutes or so. Strain the mixture and discard the flowers (although some people save them for tacos?!!). 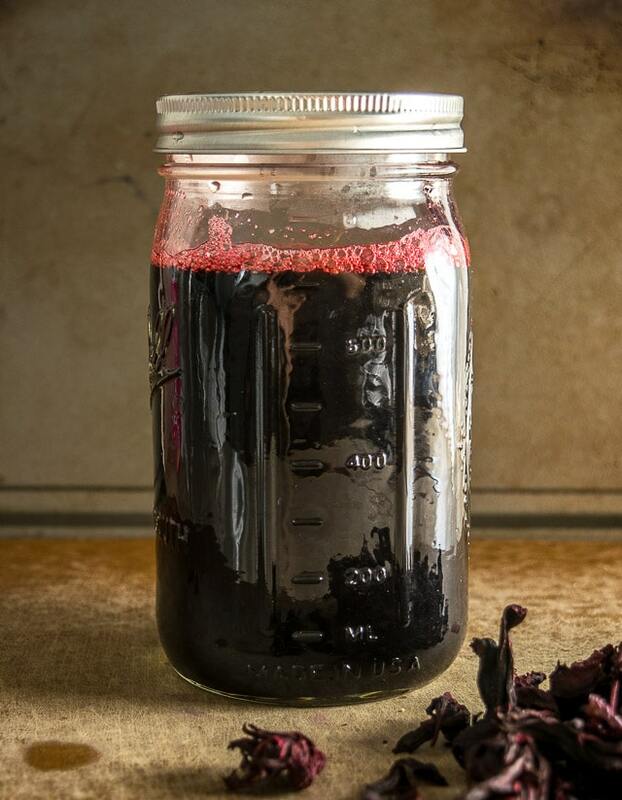 You’re left with 4 cups of Agua de Jamaica concentrate that will conveniently fit into a quart-sized Mason jar. This is a concentrated mixture that will give you leeway on how much you want to dilute and sweeten the final product. Most versions in Mexico are bombed with sugar, but for me that is no bueno and over time I’ve been using less and less sugar. I’ve also stopped diluting it as much (by adding water) and instead prefer to drink it when it’s potent and barely sweetened. I use a 1:1 concentrate-to-water ratio when making a batch. So we’ll add the 4 cups of concentrate to a 2 quart sized pitcher along with 4 cups of water. My starting point for 1 cup of concentrate is 1 Tablespoon of sugar, so we’ll add 4 Tablespoons of sugar (1/4 cup) to the pitcher. Combine well and take a taste, adding more sugar if you want. White sugar is most commonly used but you can definitely substitute honey or agave. 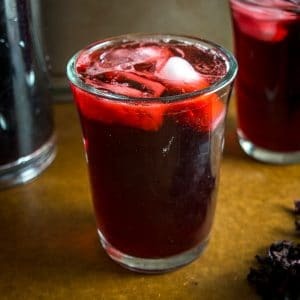 Serve over ice and just like that you’ve got a delicious, homemade Agua de Jamaica that is as close to the source as you can get. It has a light, satisfying, tart flavor that is a great accompaniment to spicy foods or grumpy mornings. There are all sorts of ways to customize this (ginger, bubbly water, spirits, wine) but the more I have it the simpler it becomes. There’s something grounding about a simple, potent batch. 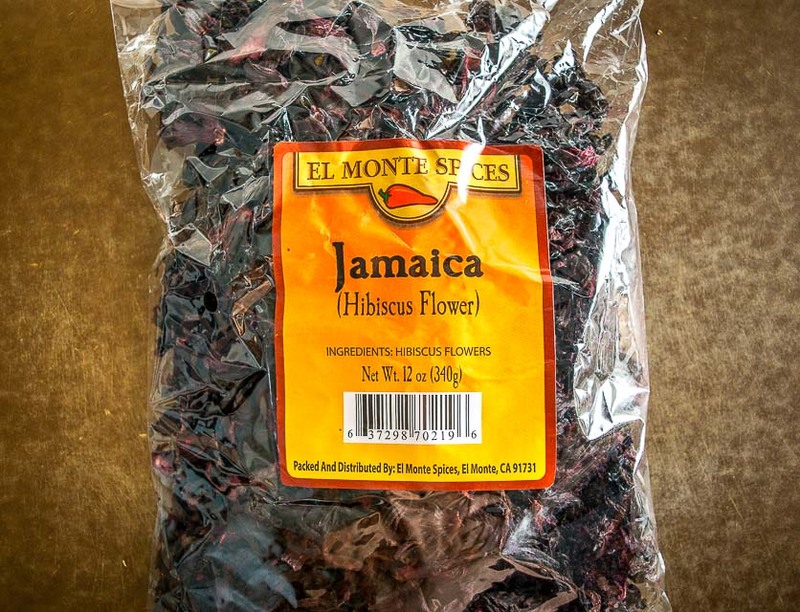 So the next time you come across a bag of Jamaica flowers toss ’em in your shopping cart. Who knows, maybe it will have you questioning your morning beverage and heading towards something a bit simpler. 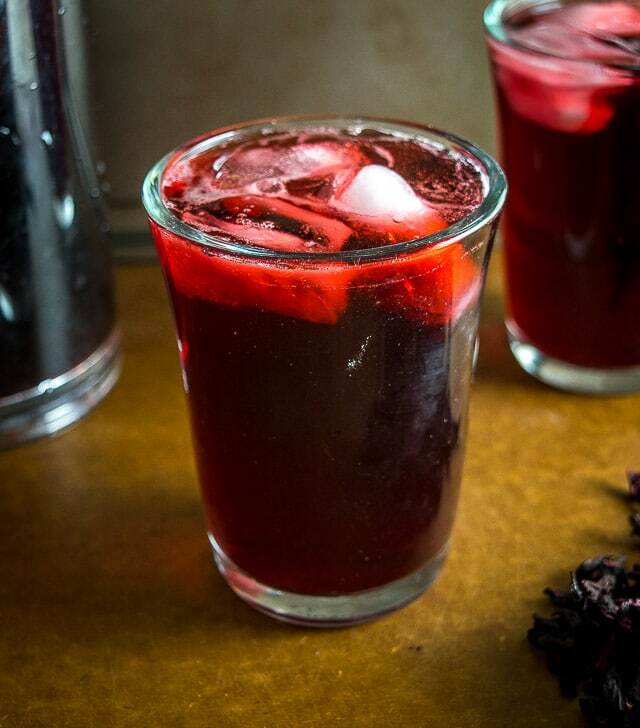 Agua de Jamaica is one of Mexico's most popular agua frescas. This version uses less sugar but feel free to sweeten it up if you want to. So good! 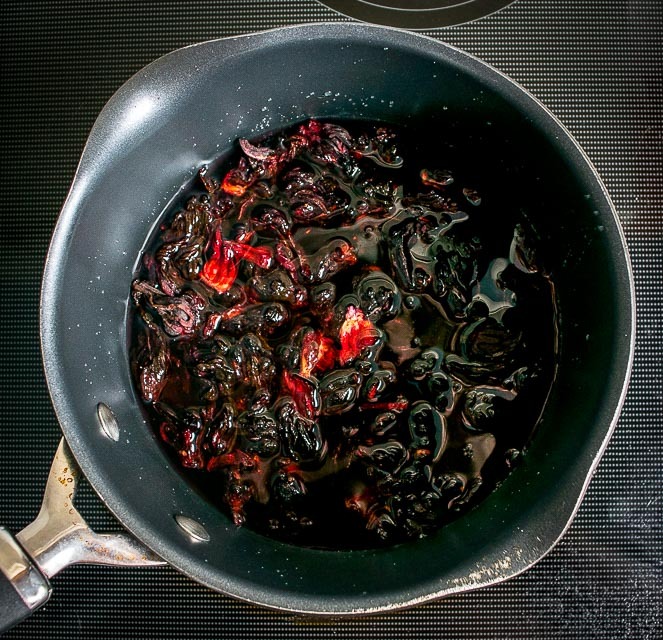 Add 1.5 cups of Hibiscus flowers to a saucepan along with 4 cups of cold water. Bring to a boil and then remove from the heat. Cover and let steep until it cools, 30 minutes or so. Strain the mixture and discard the leftover flowers. 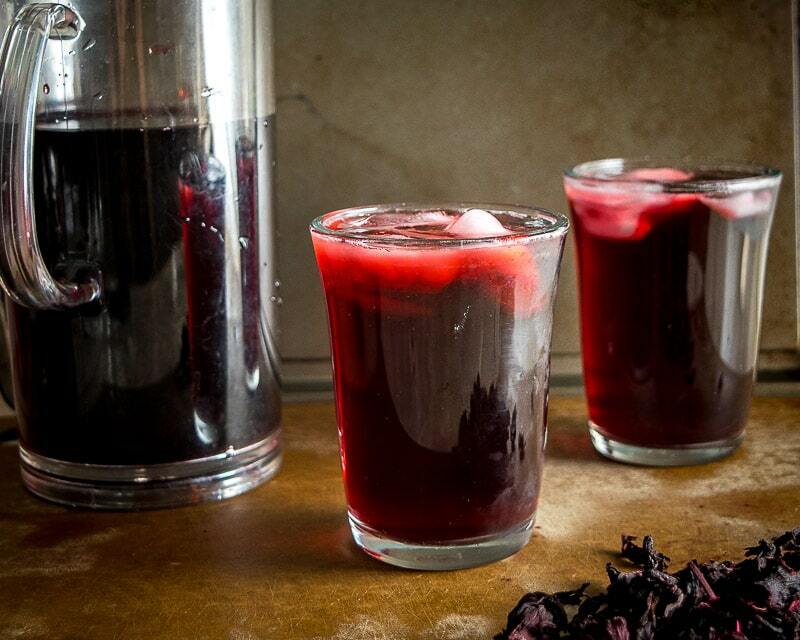 You'll end up with 4 cups of Agua de Jamaica concentrate. I use a 1:1 concentrate-to-water ratio and approximately 1 Tablespoon of sugar per cup of concentrate, but you can easily alter these once you give it a taste. Add 4 cups of concentrate to a 2 quart sized pitcher along with 4 cups of cold water and 1/4 cup of sugar. Combine well and take a taste, adding more sugar or diluting further if you want to. Serve over ice and store leftovers in an airtight container in the fridge. You can find Flor de Jamaica at Hispanic markets and even some general grocers. I like Agua de Jamaica best when it is potent and barely sweetened, but feel free to dilute it further or add more sugar (especially if serving to kids). Although the instructions are for a big batch, I will frequently keep the concentrate in the fridge and just make it one glass at a time as I need it, using a 1:1 concentrate-to-water ratio. 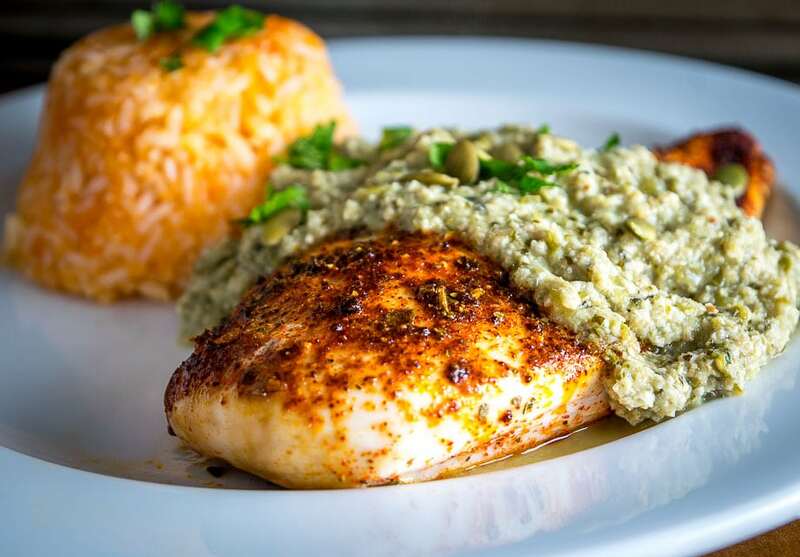 Our latest post is Chicken served up with a Green Mole (Pipian Verde). I will have to check out your Horchata post. Keep up the great work! Thanks Robert, I hope you enjoy it! 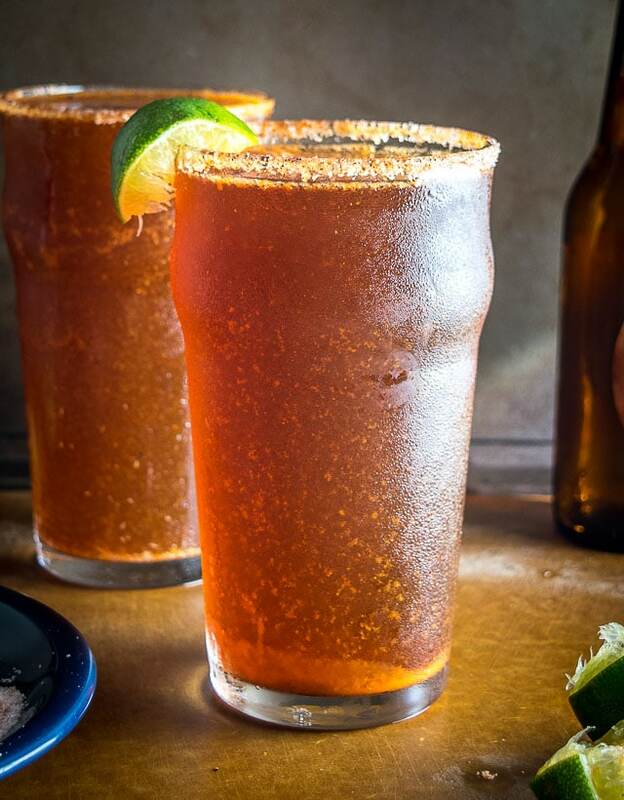 Refrescos, what a great name — I’ll try to get a Tamarind water recipe up at some point too. Cheers. I like to use Better stevia for my sweetness, but I also squeeze in a 1/4 lime and plop the rest in for extra flavor. You got me again Patrick, but this time I’m not going for the recipe just to have a refreshing drink..
Ha awesome, I’m curious about that one too. I hope it’s a ‘yum’! Thank you! So excited to try this! Cheers Jacqueline, hope you like it! Another great and simple recipe Patrick! My first batch had a bit of funky earthiness that I attribute to steeping for too long. Batch 2 and 3 which I steeped for 30 minutes, did not have that quality. I finally found a way to use these Thai palm sugar disc things that have been in my pantry for many years. Two or three inches of the tea and a can of club soda works for me. Great way to hydrate the morning after a night of craft beers…or anytime. Awesome, thanks for your feedback David — and thanks for mentioning the funkiness with the longer steeping time, that’s helpful for peeps to know. Thanks Suzy! I hope you find some keeper recipes on the site. Cheers. This is very good good with any combination of ginger, clove, and cinnamon. Popular Caribbean drink. Except it is called sorrel. It’s a special type of hibiscus that creates that tart flavor and deep red. Love this stuff! Thanks for mentioning this Jeffrey! I’m curious to try out that combo. Cheers. I am a guera who has been adopted by all my Latino karaoke fans, and I have loved this drink for decades! I have made it several times, via slightly different recipes. After looking through a few recipes on line, I have chosen this one as my go-to for concentrate. The ratio of flowers to water and the steeping (NOT BOILING!) for thirty (30!) minutes is the first reason. Also, the fact that the amount of water used will fit into a glass quart jar is something nobody else took into account. The suggestions for variations on this drink are very nice indeed! All the twists and turns in one place!